As I read through my Jesus Calling devotional this morning, I was quickly reminded that it is certainly the start of a new year. The first sentence read: “I want you to learn a new habit.” It quickly lead me to think, what is the difference between starting a new habit versus making a new year’s resolution. So I wandered over to the online Webster’s dictionary and looked them both up. Habit: a usual way of behaving, something that a person does often in a regular or repeated way. Resolution: finding an answer or solution to a conflict or problem; the ability of a device to show an image clearly and with a lot of detail. A promise to yourself that you’ll make a serious effort to do something. The reading continued with “Try saying “I trust you Jesus” in response to whatever happens to you… This is certainly easier said then done at times, especially for our children. My youngest has been having a tough time adjusting to 7th grade. She started at the public school after spending 5 years in a wonderful Christian school in the same community. Because they were in the same small town and I became keenly aware I would keep her in the smaller school system I made a very conscience effort to involve her in activities that would allow her to become more involved with her soon to be classmates. So for the two or three years prior to this year she played softball in the summer, volleyball in the winter and took elementary band at the public school. Even with all these efforts; there has still been a sense of occlusion at school this year. More moments than not when she just didn’t feel like she fit in. Needless to say, there have been a lot of tearful moments with my gentle spirited, youngest child. There is another Christian school fairly close by and shortly after the start of the second quarter, we looked into her possibly transferring. I gave this consideration because my daughter came to me and was able to list the reasons why she wanted to change schools. Yes, part of it was feeling “left out”; not included in some things and that some of her classmates were being “mean”. But, she was also able to express that she missed the enviroment of her old school. Participating in chapel, praying and studying the bible. I reminded her that it would be more expensive than her other school and that there might not be as much available as far as scholarships (which is how she attended the other school for five years). Yet, I have taught my children that God does indeed provide when we listen and follow His guiding. She was expressing to me that she felt this was God wanted her to do, so I listened to what she had to say. We checked into things at the other school and found out that there were some small funds still available (especially since it was the middle of the school year) A few weeks after going through the application process we learned that she had indeed been accepted! We celebrated and I even added it to the Praise portion of my Prayer Board. We marked the calendar with the last ten days at her current school, crossing them off one by one. I had silent tears slowly falling by this time. Such wise, God lead words coming from my youngest child… still thinking about those around her, even in the midst of her own uncertainty and discomfort. I explained that because I had been so busy working both of my jobs, that I had not yet sent in the final paperwork for her transfer. I told her, that it was OK to change her mind; especially when she felt it was God redirecting her. She was wise to listen and He would certainly reward her for that. I then quickly sent a message to two members of the staff of the public school explaining the conversation that I had with my daughter and that she would be staying. They were both excited and happy that she would continue to be a part of their school system. I also sent a short note to the Christian school explaining the course of events and that Jess would not be attending their school this upcoming semester. Christmas break was uneventful after the family celebrations; other than her planned sleepover on New Years Eve with two classmates being cancelled due to her being quite ill that day. However, last night I came home from work once again to a very tearful, fearful young girl. Satan was working his dark magic and bringing nothing but fear and uncertainty to my child’s heart and mind. She told me that maybe she made a mistake by not changing schools. She couldn’t give me anything specific or concrete, just more tears. I sent her to the shower and once the water was running, dropped to my knees and prayed for my child. I asked God to protect her from this attack, from continued attacks as the evil one knew my daughter had a plan, an agenda for the Lord and he wanted to try and thwart it. I asked for her protection, for strength, for peace and comfort. I asked Jesus to wrap His loving arms around her and carry her if needed; so that she could be His light. She came out of the shower, we prayed and I kissed her good night. She continued to softly cry until she finally fell asleep. This morning I prayed for her again before I even left my own bed. I prayed for her and her classmates; as well as the staff, as I headed back home after taking her to school. I guess my question for you is this; did you make some sort of new year’s resolution? If so, how can you make it instead a habit? How can you make it become a regular and repeated part of your behavior? Don’t allow yourself to become lazy or hesitant; instead allow Him to guide you through the tough moments, no matter how many. 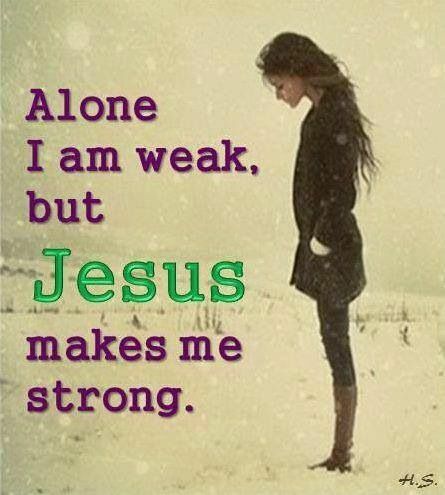 When you feel weak, allow Him to be your strength. You are never alone. Trust in Him, always. 2 Corinthians 12:9-10 But he said to me, “My grace is sufficient for you, for my power is made perfect in weakness.” Therefore I will boast all the more gladly about my weaknesses, so that Christ’s power may rest on me. 10 That is why, for Christ’s sake, I delight in weaknesses, in insults, in hardships, in persecutions, in difficulties. For when I am weak, then I am strong.